wrong." However you look at it, as a business owner, if you leave yourself and your company susceptible to disaster, you always have the chance of it happening. Due to this, you need to do what you can to protect your business, including your stored data. This way, in the event of localized data becoming corrupt or damaged, you have the ability to restore all lost information. With that in mind, there are always those who will tell you it isn't necessary to perform certain actions, when in reality performing such an action would safeguard your data even further. Learning from the mistakes of others and from poor advice helps ensure you do not fall victim to Murphy's law. Storing your data on the cloud is important. It gives you instant access to all your files, as long as you have an Internet connection. Due to this, there are some who might tell you that network recovery isn't important as long as you back everything up to the cloud. This simply is misguided and terrible advice. 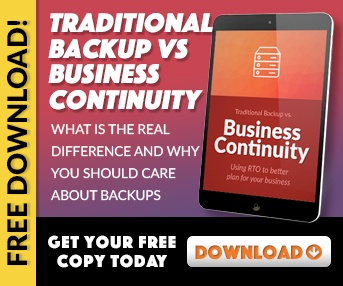 If you don't have a network recovery framework in place it will prove difficult to not only recover some data that inevitably doesn't backup to the cloud, but installing everything back to the original location on the network becomes next to impossible and extremely time consuming. While taking advantage of cloud services is important, you also need a network recovery plan in place should the unthinkable happen. When first starting off as a small business, some tech service providers may suggest you don't need a disaster recovery plan. Incorrect. No matter how large or how small your business may be, information is vital to the success of your company. Even if you only have a dozen clients instead of a few thousand like larger corporations, each and every one of these clients is important. Should their information disappear you risk losing their business to the competition and a firm with a disaster recovery plan in place. If any service provider tells you your company doesn't need a disaster recovery plan, it's time to look for a new service provider. Wouldn't it be nice if you could simply setup and install disaster recovery software once and forget about it? Life would be a bit easier. Sadly, you do need to continually update and evolve the recovery software. Potential threats change, as do the kinds of files (and the amount of files) you save on your network. If you listen to those who say you don't need to update your recovery software and to leave it and forget it, you set yourself up for extreme problems in the event of a disaster. So always stay on top of recovery updates. There will always be those out there who offer poor advice. Knowing how to identify inferior information and suggestions is vital to the longevity of your business. 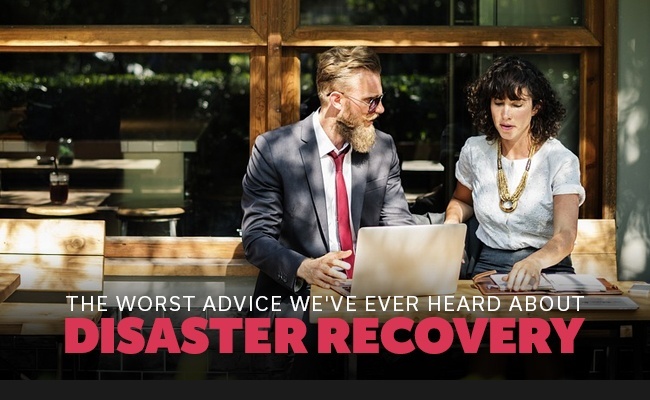 These are just a few examples of the worst advice we've ever heard about disaster recovery. Make sure to take each and every one of these examples to heart as you establish your own disaster recovery plan. This way, should anything from a power outage to ransomware hit your company, you can avoid Murphy's Law and restore all affected information.